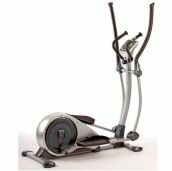 The Trainer is great for overall body toning due to its upright cycling stance and suitable for a variety of ages and abilities, The Elliptical Trainer is a great for Cardiovascular endurance and can also help improve your lower body strength, this stepper is also ideal for body toning and low impact workouts. Varied resistance/tension controller helps bring variety into your training. AND The functional LCD screen helps you track your progress and helps you improve your fitness.